The VLIZ library has written a new acquisition management plan. Aside from a description of the library’s history, the collection’s content and acquisition strategy are clearly defined. A new classification scheme is also proposed and the services are analyzed. The plan is an important step to professionalize, and to clarify the importance of the marine library for Flemish marine scientific research and ocean literacy. Input of interdisciplinary users is a unique feature in the forming of the collection. In the new policy plan of the VLIZ library, the content and (acquisition) strategy of the core collection is clearly defined, and aspects - such as the services- are thoroughly analyzed. It is therefore primarily a reference frame for the library itself. A new classification scheme is also proposed that wants to meet with the logic of researchers and other users. More functional classification based on marine and maritime domains is needed. Formal categories - which are only useful for the librarian (e.g. reports, bibliographies, serial monographs ...) – don’t benefit the users and will therefore be reduced. The acquisition management plan also makes it clear that user input is crucial to the collection development. "In the Flemish library world, the user is barely involved in collection development", says Fons Verheyde, VLIZ librarian. "But a modern librarian must dare to admit that it is impossible to follow the many different research domains in detail. Help from users is therefore not only welcome, but actually indispensable. After all, they have the best view on which literature is cutting-edge in their own research field, which items are difficult to find, etc." VLIZ goes much further than other scientific libraries and allows almost all users to play an active role. Concretely, both VLIZ staff and external users (from universities or other scientific institutions; students, teachers, guides, community groups, NGOs…) can request missing works. If considered relevant, the works are purchased or borrowed through associated institutes. “Often these are hard to find rare works, which makes our collection gain in value. Sometimes books are requested that our users want to have a look in before buying the item themselves. This makes our public of users more involved in the library experience and we are even more at the service of our reader”, says the head of the VLIZ library Heike Lust. 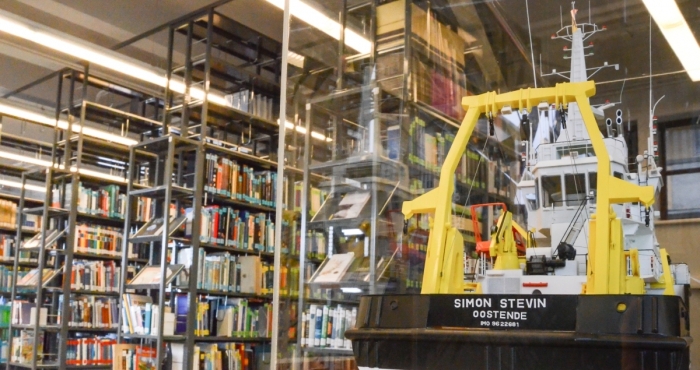 "In our library we are also big supporters of the Open Access movement with our digital archive OMA - Open Marine Archive, which reinforces our services." Consult the complete acquisition management plan of the VLIZ library (only available in Dutch). More information: librarian Fons Verheyde (fons.verheyde@vliz.be | + 32- (0) 59-34 01 85) and head of department Heike Lust (heike.lust@vliz.be | + 32- (0) 59-34 21 37).